See Phillip Island in style with our Helicopter Flight. Phillip Island boasts some of Australia's most spectacular coastline including Woolami Beach which Getaway rated as one of Australia's best surf beaches. After flying over the surfers on Woolamai Beach you will then round Cape Woolamai and be treated to magnificent views of the whole island. 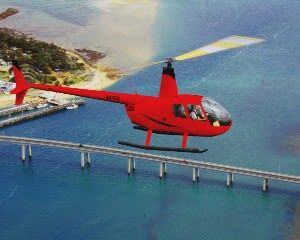 From there the pilot will carry you over the bridge connecting Phillip Island to the mainland followed by the spectacular French and Churchill Islands as well as the picturesque towns of San Remo and Newhaven.